Light, fresh and floral, with lemony top notes of May Chang, balanced by calming lavender and green tea in the natural reed diffuser. All products are supplied in a luxury presentation gift box. For more than 20 years, Parks London candles have been known across the world for their purity and quality. 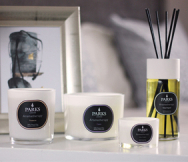 Our Parks Exclusive candles are made from finest natural waxes, soot-free wicks and carefully blended essential oils for a clean burn and true, long-lasting fragrance to enhance your home.